Scary-but-true: Heart disease is the leading cause of death for women. In 2006, one in every four deaths was from heart disease* — crazy, right? So it’s not too surprising that the American Heart Association has declared February to be American Heart Month. The goal is to raise awareness about the issue and hopefully save a few lives. One easy way you can help: check out these beauty products that are raising awareness and donating some of their profits to the cause. It’s kind of the best of both worlds — you get some cool new makeup, hair products, clothing, shoes or accessories and you get to help out a seriously worthy cause. Plus, we’ve picked out the best of the best so you’ll know you’re getting some good loot. 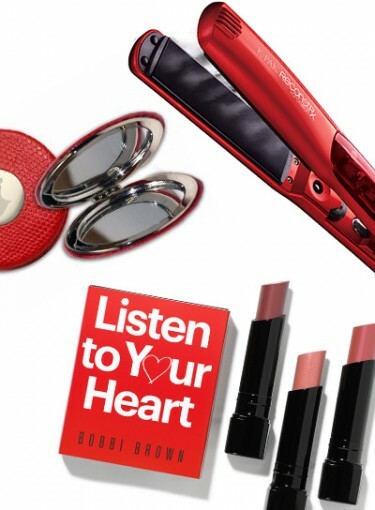 Click here to see the best American Heart Month Buys. • First step in prevention: know the risk factors. Here are the biggies: Inactivity, obesity, high blood pressure, smoking, high cholesterol and diabetes. • Get moving! Exercise is a fantastic way to fight heart disease and obesity (not to mention get you looking super-hot for bikini season). • Seriously, seriously, stop smoking. You know it’s bad for you, and it’s not “cool” or anything else you thought it was when you started, so quit already. I know it’s hard, but you can check out the American Heart Association for help. • Manage your stress. This can help with your blood pressure, but also, keeping your stress levels low in general makes you healthier, not to mention happier. So find a healthy way to relax and manage stress: exercise, meditation, manicures (my personal favorite).